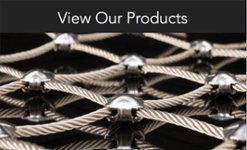 Looking through wire rope catalogs and scanning wire rope websites, you may come across aircraft cable advertised as “Made in Accordance with,” “The technical strength requirements of,” “Stranding and mechanical properties of,” or “Meeting the dimensional and strength requirements of” a particular military aircraft cable specification. Here at Loos and Company, we take special notice of this claim. In many instances, the cable that is being advertised is actually commercial grade aircraft cable and the phrasing of the claim, while technically accurate in many cases, can be misleading. If an aircraft cable truly is a military specification aircraft cable, it has been built by a Qualified Producer (see military specifications Qualified Producers Lists) to meet particular performance requirements. 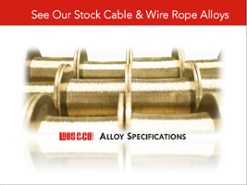 The cable has passed several levels of strength and endurance testing to achieve the military specification designation. You can read much more about the Military Specification Aircraft Cable requirements by reviewing the Specifications page on our website. By stating that a cable is made in accordance with particular aspects of the military specification, what is truly being said is that the cable in question only meets those requirements, and stops short of being a military specification aircraft cable because the omitted performance requirements cannot be met. The cable may have the required break strength, but it will not meet the cycle test requirement of the specification. So the next time you are searching for aircraft cable and see “Made in accordance with,” review your actual requirements. If you need the quality standards, performance characteristics, and traceability of true military specification aircraft cable, you need to purchase true Military Specification aircraft cable from a qualified producer. Remember, all aircraft cable is not created equal. 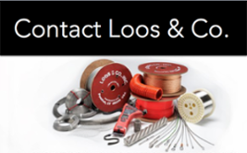 If you have any questions about Military Specification Aircraft Cable, or anything else, please contact a Loos and Company Product Manager and they will be happy to help you.